Read about the remarkable performance by Electric Diamond and videoartist Brian van Korn. "A wonderful trip into the asteroids...a fully symphonic piece of intense dignity and feeling." "Turning rock and roll into chamber music may be about as elusive a trick as the alchemists' dream of turning lead into gold, but Stuart Diamond, at least to my ears has done it...ahead of his time." "Imaginative, visual , linear music. The music Tolkien might have written if he had used a piano instead of a pen"
Commentary by Paul Adam Smelz on Concert and Live Webcast at ArtMusicCoffeeHouse. Click above for a tour of "Impressions of an Exhibition"
ELECTRIC DIAMOND is one of the longest-lived electronic performance ensembles - 35 years plus and going strong. The ensemble first performed in 1979 playing concerts at Carnegie Recital Hall, Symphony Space, the Guggenheim Museum and other venues of the New York 1970s new music scene. 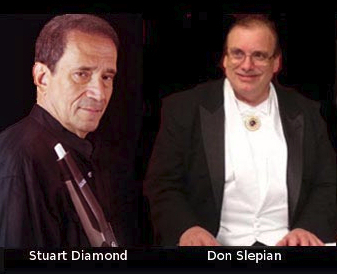 In the mid 1980’s electronic wind player founder Stuart Diamond joined forces with the eclectic, electric keyboard innovator Don Slepian, whose credits and talents are legendary – from artist-engineer-in-residence at Bell Laboratories to the original ambient sound painter for “Music from the Hearts of Space”. Together they began presenting programs that integrated classical music with free-flowing improvisations – from Bach to Mussorgsky, from medieval dances to Native American soundscapes. They have performed throughout America and Asia, performing for the erudite audiences at Steinway Hall to the mass audiences at the Macy’s 4th of July Celebration in downtown Manhattan. ELECTRIC DIAMOND's performances are truly "live", without the use of any computer sequencing or multi tracking techniques. The results are performances of immediacy, power and authentic feeling. 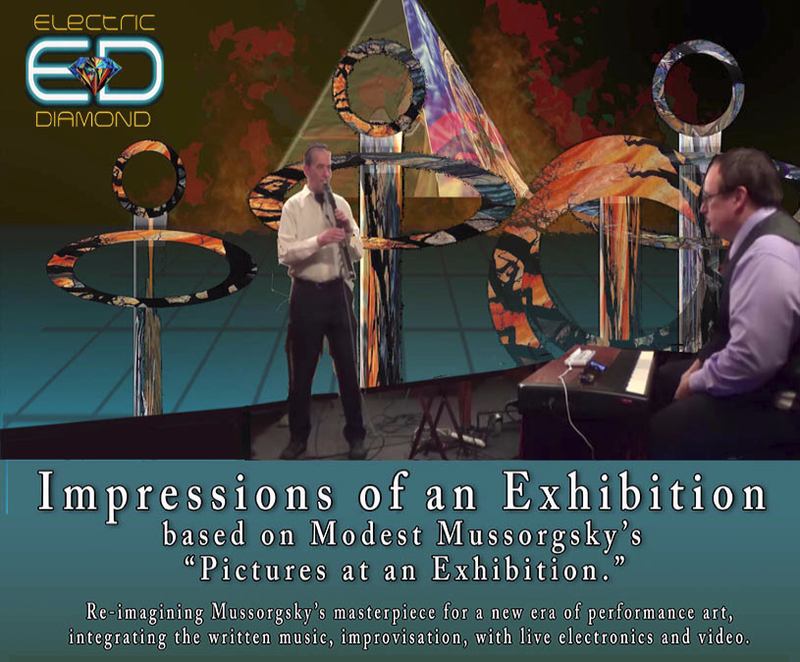 Electric Diamond performs Mussorgsky's "Pictures at an Exhibition"